Way back when, we noted that mathematical odds and political science all but ensure that eventually, scandals happen in presidencies. 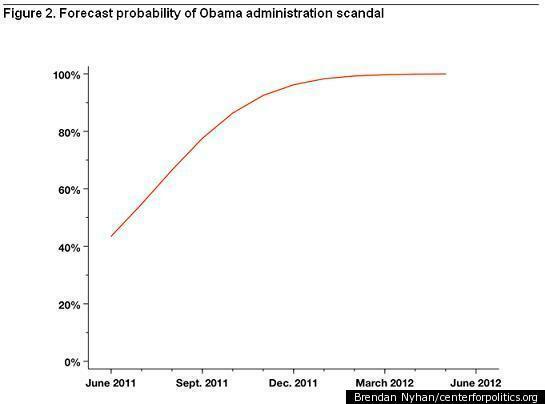 Going forward, though, the odds of scandal are high and rising. Obama already faces low approval among GOP identifiers and a similarly hostile climate in Congress. Back in March, New York Times columnist Paul Krugman noted that Republicans hadn't yet made a serious effort to back up claims that the Obama White House is "one of the most corrupt administrations." As more time passes, pressure to find evidence of misconduct is likely to build -- my data suggest that the risk of scandal increases dramatically as the period without a scandal stretches beyond two years. I am not nearly as canny as Nyhan. (Nor am I as uncanny. It's weird how the English language works.) Back in May 2011, I assayed Nyhan's work and predicted, "scandal is all but certain. And yet I'll still bet you $10 that when and if it surfaces, the story won't be broken by the White House Press Corps." ABC News White House Correspondent Jonathan Karl broke the story on the 12-times-revised Benghazi talking points, so I guess I owe him $10. He's got a whole administration full of people who could slip up at any moment and, say, funnel arms to anti-American extremists. Yeah, and then I linked to David Wood's story, "Anti-American Extremists Among Libyan Rebels U.S. Has Vowed To Protect", like a boss. The takeaway, I guess, is that America should just not have second-term presidents.